Stine Hoff has been designing and blowing colourful glass-objects since 1990. 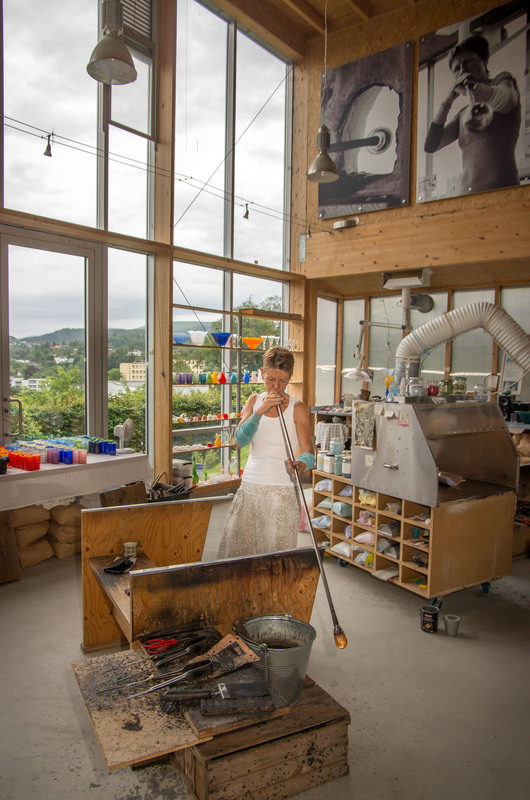 Her glassblowing education was done at Brabrand school of glass in Denmark and Orrefors school of glass in Sweden. In 1992 she established her own studio in Bergen. Now, over 20 years later, she is a recognized glassartist, having had exhibitions in all parts of Norway. Stine Hoff is mostly using classical glassblowing techniques when working with glass, but she also uses other techniques. She is fascinated by glass as a material and by the process where floating glass must be shaped to its final form. She has always been fascinated by the unforeseen parts of the process, and the uncontrollable element of the material used. «It seems like the glass has its own will, and I have to work fast, firmly and 100% concentrated to give it a final form that represents the initial idea and scetches». Stine Hoff makes many different kinds of drinking glasses, candleholders, vases, plates and dishes. She wants her products to be functional and simple with a modern expression. Her works are available in her studio in Øvre Hopsnesveg 2, close to Edvard Griegs home «Troldhaugen» in Bergen, and can also be ordered by sending an e-mail to post@stinehoff.no.